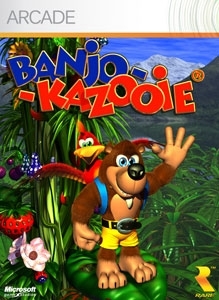 In 1998, Banjo-Kazooie was the duo’s first romp in adventure land. Carrying on the age-old tradition of bear-and-bird-in-backpack-must-rescue-the-soon-to-be monster-ized-sister-from-ever-so-ugly-but-sometimes-poetic-witch type fairy tale. It’s a classic combination for your enjoyment. Now brought to you 100% intact in lovingly upgraded gaming form and cause we’re really nice, if you have Banjo-Kazooie: Nuts and Bolts, the legendary Stop N Swop feature is at last activated. Look out for the hungry clams and dangerous ice cubes….